Every now and then, a little ripper shows itself up in the test drive arena. The all new BMW 330d is one of those very special cars that just has to be driven to be believed. Effortless performance backed up with loads of grip and awesome brakes make driving the BMW 330d a driving moment to be savoured. What makes me quite jealous is that this very special driving pleasure is only reserved for the lucky owner of a BMW 330d, time and time again. Meeting corners in the BMW 330d is not one of trepidation – far from it, in fact. Every corner that springs up is met head on with one big smile from ear to ear from the BMW 330d driver. Not only can the BMW 330d be held firmly planted through a fast corner, the power from the powerful 3.0 litre engine is unbelievably exciting and can be sourced to exit a corner instantly. Straight line speed is incredibly good, and any road undulations are kept superbly in check via BMW’s supremely good 3-series chassis. From the comfort of the BMW 330d driver’s seat, the direct steering and excellent feedback are a reassuring blend of sporty driving and refinement. Out on the open road, it is very easy to creep quickly up on any unsuspecting slower traffic and, without a moment’s breath, the sleek BMW 330d has the ability to pounce and streak by, leaving vehicles well behind in its tracks. It looks superb too. The very purposeful front nose is of a low profile, where the big air dam housing big air foils that not only hold the car to the ground at speed but also offer superb engine cooling characteristics as well. Elegant tear shaped headlights are striking to look at, and the curvy, sleek roof-line and body work are very reminiscent of the pleasant curves found in God’s greatest creation – the woman! BMW have undoubtedly got the lines and curves perfectly honed, as almost everyone turns to appreciate just how good the BMW 330d looks as it passes by. Take a look inside; better still, climb inside and appreciate the BMW 330d experience. All the switchgear is pleasantly at hand. The design flair is passionate and lively – without being ostentatious – creating an environment that is light and comfortable, roomy and relaxed. Seating is excellent – and I mean excellent. A long journey between two of Australia’s main cities will soon bolster in your own mind just how good the BMW 330d is to tour in. All the finest luxury is on hand to provide a cabin ambiance that is serene and pleasant – regardless of how quickly the car can cover the ground outside. Leather seats, knitted with artistic stitching and premium workmanship, top of the line audio sound systems, electric seats, electric mirrors, climate control, airbags at the front and along the full length of the sides of the car’s interior, cup holders, sat nav and telecommunications are available to make your journey all that more satisfying. Expect the best, because you won’t get any less. Diesel technology has come a remarkable distance over the last decade or so. So much so that all luxury car makers, except a few, have diesel engines powering their flagship models. BMW have the athletic 3.0 litre diesel unit powering their 330d. A six cylinder, and a mighty smooth one at that, has all the torque you will ever need. The performance statistics speak for themselves. Take a look at the low down power: 520 Nm are available from revs my car would be happy idling at! At only 1750 rpm, the BMW has already enforced its hold over the road ahead. Swing through to 4000 rpm, and the full 180 kW of engine power is reached. The blend of low-down torque and high-end engine power makes for exciting performance. The BMW 330d can master the 0-100 km/h dash in only 6.2 seconds. The limited top speed of 250 km/h provides effortless high speed travelling in a body that looks so impressive. Safety is an area that BMW always works hard to improve, and with the latest 3-series, a five star European crash testing result proves that BMW is at the top of their game. 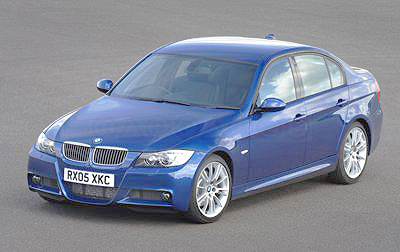 ABS, TC and EBD are some of the active safety features available, while side intrusion beams, a high strength safety cage, purpose-built crumple zones, pretensioning seatbelts and anti whiplash head restraints are some of the top level passive safety features packaged into the BMW 330d. Dual stage airbags and pelvis and thorax airbags are leading edge. Small children are carried in a very safely cocooned environment. ISOFIX points, pre-built into the car, ensure carrying smalls is safe and easy. It isn’t often that I can brag about a car that seems to cover the bases so well. There are few cars out there that can match the BMW 330d in all aspects, and the BMW 330d comes in Cabriolet, Coupe and Sedan forms – just to make it that little bit more tasty! For any more information on the BMW 330d, or for that matter any other new car, contact one of our friendly consultants on 1300 303 181. If you’d like some fleet discount pricing (yes even for private buyers! ), we can submit vehicle quote requests out to our national network of BMW dealers and come back with pricing within 24 hours. Private Fleet – car buying made easy!